Join me and countless Japanese players online today, with the wide-release of the latest Lost Planet 2 multiplayer demo. Just because it only has one map doesn't mean the new Lost Planet 2 multiplayer demo isn't worth downloading. 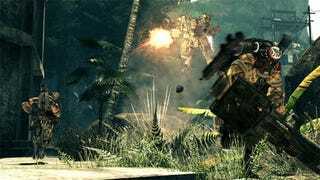 The Turbulent Jungle map is lush and expansive, and interested players should be able to score a couple of hours' worth of learning the ropes in the two included multiplayer modes - Elimination and Data Post Battle. I certainly had a good time, and look forward to a flood of new players to chunk grenades at. The demo is now available for download on Xbox Live, with PlayStation 3 players having an extra day to wait due to Sony's strange love of Thursdays.